JRR TOLKIEN: The Lord of the Rings. Folio 1st Printing. Published in London by The Folio Society in 1977. First edition, first printing. 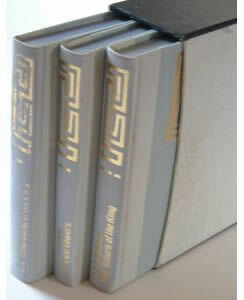 Three volumes in publisher's card slipcase. A set of the scarce first printing of the Folio Society edition. Published in London by The Folio Society in 1977. Perhaps one of the most attractive productions of the trilogy and also, in the first printing, perhaps one of the scarcest. 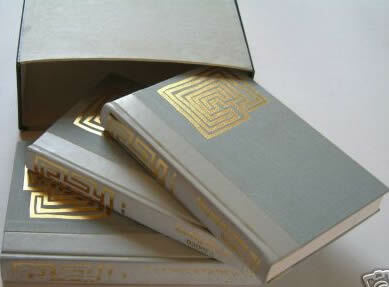 Three volumes bound in cloth and grey faux leather, the boards blocked in gilt with a special design by Jeff Clements. All three volumes are illustrated by Eric Fraser, one of the artist's last commissions before his death and superb examples of his work.